You Tube, along with Google Video, iTunes , iFilm and others, are really shaping up. It’s this combination of easy to use tools (uploading, searching etc) with global distribution that make the web sing. You Tube was started in 2005 by three ex-paypal guys and roared to success on the back of cult clips such as Lazy Sunday. It uses Flash to play movie clips and moderates content – but it’s the sheer volume of uploads that’s amazed everyone. Google Video is similar but with a payment method, like iTunes. Tens of thousands of clips are uploaded every month with millions of views and global epidemics of viral behaviour. Viral videos (Stewart’s Crossfire, Lazy Sunday, the Star Wars Kid, askaninja) have fuelled the video sharing market. This is the stuff that kids talk about, using word of mouth/ mouse. Camera phones, free editing software, camcorders and blogging (You Tube allows you to link clips to your blog) have made the whole thing a sort of medium in itself. Let’s learn from this. I had to give a session on 'How We Learn' this week at a major bank and had to teach them to juggle (hackneyed I know) – You Tube had dozens of excellent coaching clips on how to juggle. Got to learn something? Go to these sites and get some free stuff. Teachers and trainers should be using it in their organisations to deliver videocasts . The mess is the message. Check this video clip out. It says everything about the way video should be used with this new generation of learners – low production quality, highly creative, quick cuts, surreal script, oblique, funny…. watch it and learn! Now take an hour to browse through You Tube, Google Video. Bob Mosher is one of Microsoft’s evangelists – fun guy, full of bright ideas, which he loves to share. We used Net Meeting to get his talk up and running at the Moving Learning conference. This is perhaps the best conference I've been to when it comes to moving the debate about formal/informal learning forward. As Chair, Bob's talk was a challenge, as the link went down mid-presentation. Given this data, why rely on fixed, largely classroom based, up-front courses? He recommends Microsoft's new GEAR blend. Gather people physically or virtually to explain the new approach and what we all want to achieve. Expand their knowledge through resources and content. Apply this knowledge in the workplace in real projects. Receive feedback on performance. This bridging knowledge into the workplace using a blend. Chaired the Moving Learning conference last week which took a long hard look at informal learning. I liked Alison Rossett's on performance support (planners and sidekicks). This is my own spin on her ideas. As learning become more fluid so must the tools. Courses are, in most cases, too crude. It means using SOURCES, SHARPENERS and SIDEKICKS. Look up a fixed source, work out your route, note down the road numbers and perhaps add up rough estimates of each legs to work out the ditance, then do a little arithemetic to work out how long it wil take you. Look up a route planner website, type in start point and destination, out pops your personal list of directions with details of every leg and a total calculated time. Print it out and have it alongside you in your car. Satellite navigation gives you realtime feedback and directions (turn right/left) and helps you get back on track when you’re lost. They also give you relevant GPS information on petrol stations, restaurants and hotels. Knowledge bases, repositories of learning content. Personalised learning environments, email, reminders, feeds, wikis, blogs. Performance support software and mobile learning. Interestingly, to get to Microsoft, in Reading, I would, in ancient times, have a source such as a rail timetable or gone to a source station to plan my rail route and times. Now I have my sharpener website where can get my personalised rail times, including details of changes. I sharpened up even more , as I looked to the Microsoft site and found out that there's a free bus straight to their door every ten minutes. When I got to Reading I used my mobile to tell the conference organiser that I was running late - she gave me the exact building to go to to save time when I arrived - my mobile sidekick. Had a lovely few days in Amsterdam and the Hague with a few friends last week and came across this wonderful Rembrandt. He was a cute observer. 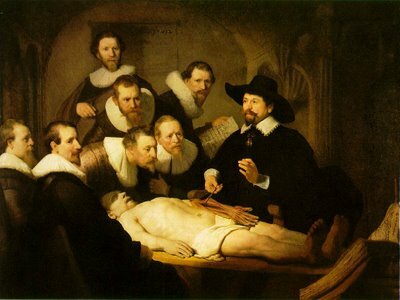 Not one of the learners is looking at the dissected arm. The top two are disinterested, eyeing you (the viewer) up, a couple are straining to look at the book and another staring off into space, lost in thought, only one is looking and listening to the teacher. What a wonderful study of learning in practice. Suddenly an English Art Tour arrived, pushing me to one side as their guide started to unravel the secrets of this Rembrandt. I looked around and sure enough, few were listening; some were lost in thought, others talking to their friends, some looking at others in the group and gallery, one trying to work his camera and so on. Rembrandt was showing us how inefficient the lecture was 350 years ago! Brilliant podcast from the great Peter Drucker. Deaf now, the questions had to be written down for him to reply, but he's as sharp and incisive as ever. He lamblasts the current cult of leadership and leadership training. "All that talk about leadership is dangerous nonsense - it is a cop-out, forget about it", he urges. "We should be suspicious of leaders and their charisma", he adds. Finally, "If this makes me very unpopular, I hope I am." Of course, he's absolutely right. The training world leapt onto the 'leadership' bandwagon with dozens of different and contradictory theories, then thought that 'courses' on leadership would be our saviour. It's all based on narcissism; cocky managers commissioning their own training departments to flatter them. In practice, most of these courses are messy quilts patched together and served up as a comforting cover for middle managers who want to dream that they're budding Ghengis Khans. There is surely nothing more laughable than seeing the guy with the combination lock briefcase on the 7.15 Brighton to London train reading "Sun Tzu and the Art of Business: Six Strategic Principles for Managers". Here we go again. Just as we are getting over the LMS, LCMS. MLE, VLE and a dozen other acronyms for systems that want to command and control learning, we have another; PLE (Personalised Learning Environment). Just as we realise that learning is a highly personal experience, we want to can it, label it and sell it top-down in the straightjacket of a piece of software. To be fair this is a genuine attempt to look at software from the learner's perspective, all of the previous systems were really top-down, organisational and institutional control mechanisms. However, in this new debate we already have the top-down, middle-out and bottom-up camps. On this one I'm firmly in the bottom-up camp. We already have our PLE - it's called the internet. I have a desktop, browser, bookmarking, a couple of blogs, and can easily organise sources and tools for my personal learning. In fact, it is important that I stay in this environment as it gives me the necesssary freedom to add, delete and modify in a real and instantly accessible environment. With Firefox and Flock it's even easier - just make your browser a tuned-up learning resource. I do have some sympathy, however, for the middle-out, personalised 'learning' or 'knowledge' home pages. Even this is easy to do - there's lots of tools for personalised home page construction (without the need for any programming). What this move does signify is that the first wave of top-down learning-specific software is now in terminal decline. Why buy an LMS, virtual classroom or other learning-specific piece of software when the web has loads of better stuff for free. What we're seeing is the death of top-down, expansion of middle-out and explosion of bottom-up approaches to learning. Saw this headline in Schipol airport, had a read in the bookshop – and was duly shocked. 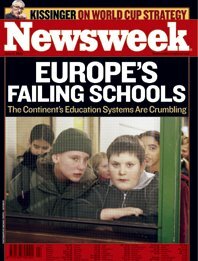 The ‘Centre for European Reform’, a well respected London think tank, has issued a damning report this week showing that a "grim" educational "malaise" has gripped learning in Europe. Most of its universities are "clearly in the second division," and at all levels—primary, secondary and universities—America and Japan significantly outspend Europe. Study after study, by the OECD and others, has shown high-school achievement as stagnant or slipping. At the heart of the problem are education systems that often seem stuck in another age with European employers complaining that "The education system is sending us people who aren't even ready to be trained." Another scathing criticism was the gulf between universities and commerce. Business-university partnership, which plays such a powerful role in America's scientific and entrepreneurial prowess, is sorely lacking in Europe. The only high spot is Finland, ranked by the OECD as having the world's best education system. It had problems in the 60s but radically devolved devolved decision making from Helsinki bureaucrats to the schools themselves. With centralised guidelines, schools and teachers are monitored for quality, and constantly evolve in terms of curricula and methods. Old-fashioned sorting and streaming into different-level schools has been abandoned and now Finnish 15-year-olds not only score highest in a number of skills, but also show the least effect of class background on achievement, a key measure of meritocracy. The result – an economically strong Finland with high growth and low unemployment. So, despite huge increases in education spends over the last decade we have seen, at best marginal, at worst declining, performance. The key here seems to be outdated models and methods - basically Victorian schooling. Yet the answer to bad schooling is always more schooling. I’ve suddenly noticed that everyone’s jumping on the compliance bandwagon, with oodles of generic content and tracking systems. Could it be that, far from taking a strategic role in businesses, training is literally painting itself into a dark corner, where it will be increasingly ignored. Last year’s infamous Fast Company article ‘Why We Hate HR’ predicted this, claiming that training departments will “ghettoize themselves literally to the brink of obsolescence”. Millions of sensible people are being churned and batched through patronising, often accusatory, courses that have no real behavioural impact. Even if compliance were to add vale to businesses, most of these courses are counterproductive, being largely knowledge-based. In most, you will literally lose the will to live. I have only seen one exception to this (the courses produced for Apple). Senior managers know that this is all a big game and that it has no real business impact. It’s merely a protective immunising jab so that people can point towards some spurious LMS report showing that ‘x’ employees completed course ‘y’. This is all about attendance, not attainment; literally ticks in boxes. In fact, I’d argue that the time and resources taken to plan, design, deliver and track these courses outweigh any possible business benefits. In practice, this huge effort is likely to lower overall performance. Learning and HR professionals complain about not getting a seat at the top table and we never will if we willingly define ourselves as delivering dull compliance programmes that have nothing to do with personal development and everything to do with the organisation protecting itself from its employees. This may turn out to be the best lecture I've never attended. I had to leave before Dr Itiel E. Dror gave his talk, at the e-learning forum, but we had a chat in the break and he left me his excellent paper. Even more worrying has been the sudden entry of non-empirical sociology, which claims that all learning is a social construct. This manifests itself in the truly awful Vygotsky cult (oft quoted, seldom read) with his pseudo-Marxist, unscientific theories, loved by instructors as it puts them at the centre of the learning universe. He is learning’s Lysenko (they were born within two years of each other). It's as if we are stuck with a combination of old, discredited science and bogus new-age sociology. It is clear that cognitive overload is the greatest consequence of not understanding how knowledge and skills are acquired. The failure to understand how we prioritise and select information, and a lack of detailed knowledge on chunking, top-down processing and modularity, lead to demeaning, over-demanding or dull learning experiences. Expectation, motivation and engagement all have optimal techniques, which can be used to increase the efficiency of learning. Cognitive overload is at best a waste of resources, at worst a destructive force in learning. Yet far too much training ignores the fact that less is more. We need to understand how to remember in order to retrieve, and so we need to understand how the different memory stores/structures/systems work. This is an area rich in solid research, from Ebbinghaus onwards. Working Memory is different from Long-Term Memory. It is vital we understand how these work, along with the two different types of LTM; semantic and episodic memory. Then there's incidental versus intentional learning, inferential reconstruction and context sensitive retrieval. These are pretty solid pieces of science that can be used to inform the design of learning experiences. Yet how many teachers and trainers know what these terms mean? If we were engineers we'd know the basic laws of physics, yet in the learning game we can sail on, oblivious to how memory actually works. Appropriate representations can be recalled but we must be aware of their limited scope. This is a trade-off between efficiency and flexibility. This 'transfer' problem is fascinating. How do we recall learnt knowledge and skills and apply them efficiently? The whole area of practice and work-related activity swings into action. Practice makes perfect, yet in education this is reduced to cramming, and in training, with its fixation on single, episode 'fixed duration courses’, ignoring actual reinforcement and application on the job, is largely ignored. Itiel has a sensible and measured run though of some basic ideas around how we acquire, store, recall and apply knowledge and skills. His appeal for the practical application of experimental psychology to learning is badly needed. Gave a talk at the e-learning forum taday and it struck me afterwards that blended learning has taken root but it has no define shape, theory, methodology or best practice. You can call anything a blended solution. Most of the definitions are really 'blended instruction'. All we have are lots of unvalidated examples. Blended learning, in practice, seems to be simply a nice way for the old world to cope with the new. It's a sugar coating on what many see as a bitter pill - the fact that the dominance of the classroom is fading fast. Technology is providing the social spaces, content, tools, access, media types that allow us to learn what we want, where and when we want. Blended learning is simply a cipher for the process of coping with that truth. It's a soft term that hides a hard, and for some unpalatable, truth. Blended learning is starting to embrace a huge variety of 'word of mouse' techniques in learning. We need to see Blended learning (not instruction) as being focused on learning, not instructional techniques. With the web we have the learners themselves create, access, comment and use content. This really is matching the learner with their actual needs. It copes with different personality types, preferences and needs in a way that traditional training and education does not. In short, blended learning means that the war has been won. Technology based learning is here to stay, an irreversible trend that will radically change the way we learn on a similar scale to the way it has changed the way we work.